A fantastic tour through one of Norway's most beautiful valleys, the Aurlandsdalen, known as the "Norwegian Grand Canyon" due to its natural landscapes. It is impossible not to be impressed by its fjords and mountains. We will start our coach tour by leaving the port at Flåm and skirting the fjords all the way to Aurland, a typical coastal town with a wonderful stone Gothic church from the 13th century, with windows painted by Norwegian artist Emanuel Vigeland. From Aurland we climb the river of the same name - known for its abundance of salmon - and, having passed the Vassbygda lake, we reach the village of the same name. Hydroelectric power is produced here, as you might deduct from the many power lines. The generators are located inside the mountain. The road that takes us even higher, up to Laavisdal, comprises hairpin bends and tunnels, giving us a magnificent view of Vassbygda and the region of Aurland. We climb further, to Stonndalen, a spectacular wide mountain valley typical of western Norway. 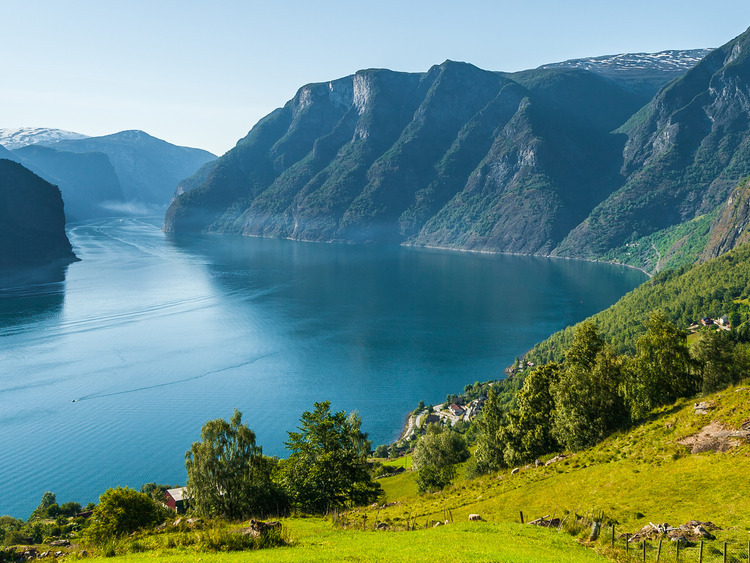 Finally we will reach the Aurland valley which, with its breathtaking natural landscape, is known as the "Norwegian Grand Canyon" and is one of the country's most famous tourist routes. The valley, from Geiteryggen to Vassbygdi, is roughly 40 km in length and varies between 50 and 1660 metres above sea level. Along the way, we will admire the spectacular scenery, which is rich in flora and fauna. We will cross the valley to Østerbø, a small farm that was inhabited until the end of the 1920s. During the winter, a season that could last from six to eight months in this region, the farm was totally cut off from the rest of the world. At Østerbø we will enjoy refreshments, before taking the same road back to Flåm.